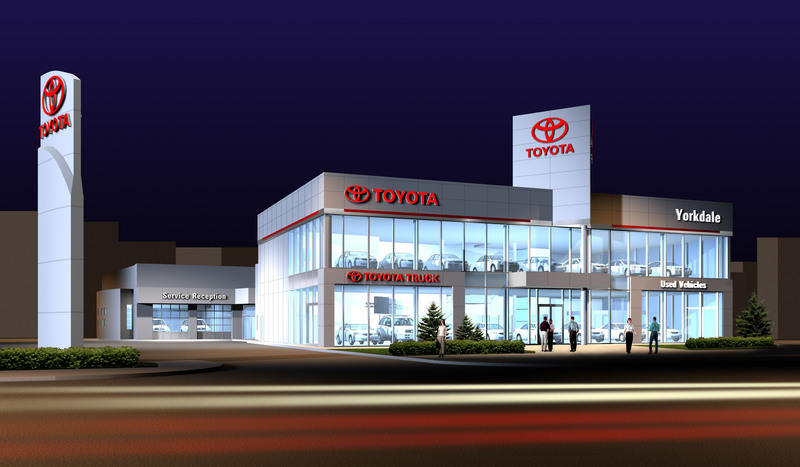 Yorkdale Toyota | Richard Ziegler Architect Inc.
Richard Ziegler Architect was retained by the Policaro Group to re-clad the existing Team Hyundai Dealership in Brampton. The facility is scheduled to be replaced in two years time so the cladding and signage has been designed for reuse on the new facility. The scope of work included Design, Construction Documents, Tendering and Construction Review. We were also responsible for coordinating the signage requirements and installation. Construction commenced in early late July and was completed in early September. The facility remained operational for the duration of the work.